The spring of 1976 was basicly an ordinary spring in Sarek National Park. The only thing unusual was the early high temperatures. Wich meant that parts of the mountain massifs had an early snow melt off. Here's the unique story of Åke Wahlquist from Lindesberg. 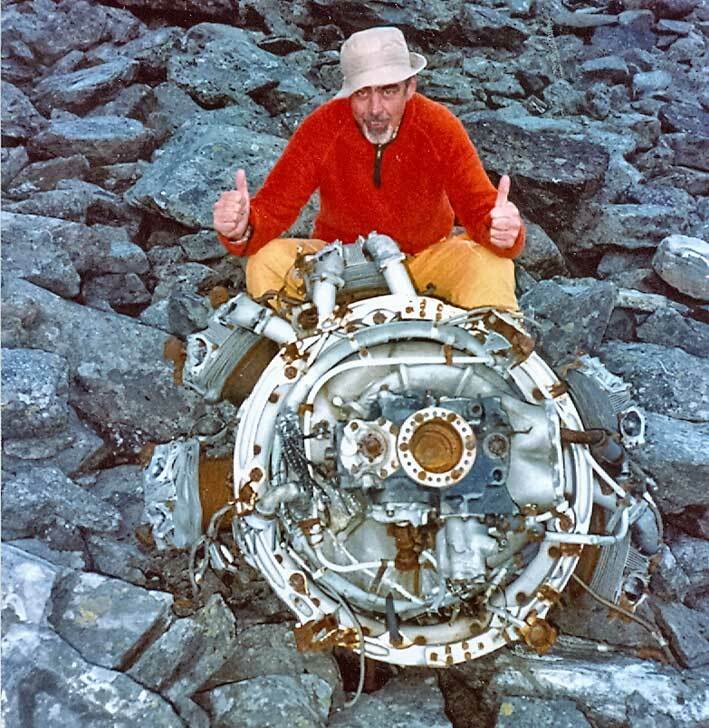 In August 1976 Åke found an aircraft that had laid untouched for 34 years on a mountain peak in Sarek National Park. August 1976, a successful hiking in Sarek National Park is coming to an end. Me and my brother is coming from Sarvesvagge via Jeknavagge and is passing down in Njåtsosvagge. It's an amazing sight with the three deep blue Njåtsos-lakes that greets us. We have good fortune with the weather and make camp east of Lulep Njåtsoajaure. Before the evening cold begins to take hold we have time for a nice bath. Hike to the Tsatsa peak. The next day the weather is still good. Its my brothers first trek and he is tired. During an eight-day hike we have made several crossings of mountainpasses and he now wants a day off to rest. I suggest an ascent of a nearby peak. When standing at Lulep Njåtsosjaure you see the extremely magnificent Tsatsa. But I must go by myself. I walk up the valley to the east of Tsatsa and attack the hill from there. It will be a strenuous hike uphill. Half way up stands a herd of reindeer and cooling off in the snow patches. I hike and climb for several hours. First I see the reindeer as dots above me. Then I come pretty close to them but they dont seem to care, and finally they revert back to black spots. But now below me. Once up on the ridge at the peak of Tsatsa I get a great reward for my efforts. All the peaks in Sarek, the huge plateau Luottolako in the foreground, Padjelanta with Virihaure, Saggat at Kvikkjokk Tjuoltavagge and Njåtsosvagge. Just a few feet in front of me, but 3600 feet below is my brother at Lulep Njåtsosjaure. I can of course not see him but the white dot I conclude is our tent. During a mountian trainingcourse in 1970 by Staffan Tegner I learned some good techniques in hiking mountainous terrain. I have always mostly been a traditional hiker and avoided the more technical ways to get around. But I had learned and applied a rewarding and quick way to move downhill through snow. When I climed the peak I noticed a number of long moderately steep snow patches and decided to use these on the way down. This meant that I leaved the peak of Tsatsa to the south and then turn off to the east. I'm still only a few hundred yards from the peak and walk east across a huge stone desert. I follow each step with my eyes. Among the stones I suddenly spot aluminum pieces and other metal. I continue automatically several more steps before I react. I stop and open my eyes. A few hundred yards away is something I never expected to see. Tsatsa turns out to be a mountain few climb and Sarek a true wilderness. I walk over, in a bit of a shock. I stand by the cockpit and thinking about what I really see. Among the relatively empty wreckage of the plane, a little electrical installations and other simple equipment. Only then, I look down around my feet. There is a skull, which I see only now, and other skeletal remains of a human. This, together with a large number of bombs, ammunition, machine guns and all sorts of rubbish, helter-skelter among the stones. The bombs I learn are oxygen cylinders. The aircraft has burned and there are no fabrics left on it. Two other crewmen who either managed to crawl out of the wreckage or got thrown from the plane in the crash is in their flying coveralls. Among the rocks some distance away from the plane I find a book, still perfectly legible. The title is: "A diary from Berlin." There are also all kinds of other things among the rocks, a toiletroll, a medical bag. I have some film in my camera and take some pictures. I have no idea what it is that I have found. But I understand that I am the first person on the scene after a disaster, and I also realize that what I have found is a World War II wreck. Three days later, I am in Kvikkjokk and alert the police. The next day just after we left Kvikkjokk by helicopter I see a white spot on Tsatsa. I'm the only one that knows what it represents, the wreck of a World War II aircraft. I participate in the first study of the site and one, for me, somewhat comical cordoning off of the crashsite. After some searching in the area we find the three men's revolvers. 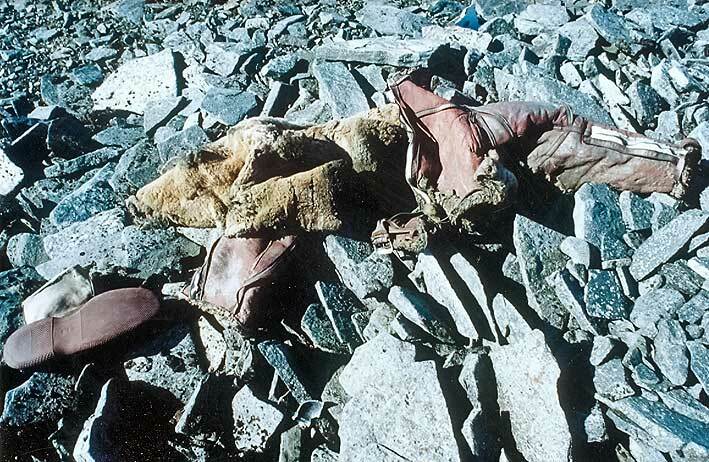 We also find more than three parachutes, but that someone had survived the crash seems quite impossible. Apparently there is a extreme news drought, and Swedish and international newspapers write about this daily for one to two weeks. It was exciting and it took several days before it became clear what I've found, and what happened a September night during the war. Evans and Sowerby says that they crashed with a bomber on Norwegian territory about 15 english miles from the Swedish border. Onboard the aircraft was in, addition to Evans and Sowerby, three Canadians who perished when the plane caught fire. Evans suffered some abrasions on the right half of the face, forearms and hands, but were otherwise unharmed. Sowerby was completely unharmed. After the crash they were captured by Norwegians and two German soldiers and taken into custody in a Norwegian village. After one day and one night they succeeded, with the help of locals, to flee eastward along a mountainvalley. Towards the Swedish border. From there they followed a rivervalley to Kvikkjokk. They had been on the road for 7 days and 6 nights. During the journey they had slept under the stars and not met a human being. They fed on rations in tablet form wich they brought in their uniforms. The refused to give detailed specification of wich unit they belonged to and the aircraft. But they had taken off from a base in Scotland. This wellknown story made the investigators suspect that the wreck found in 1976 was Evans bomber. 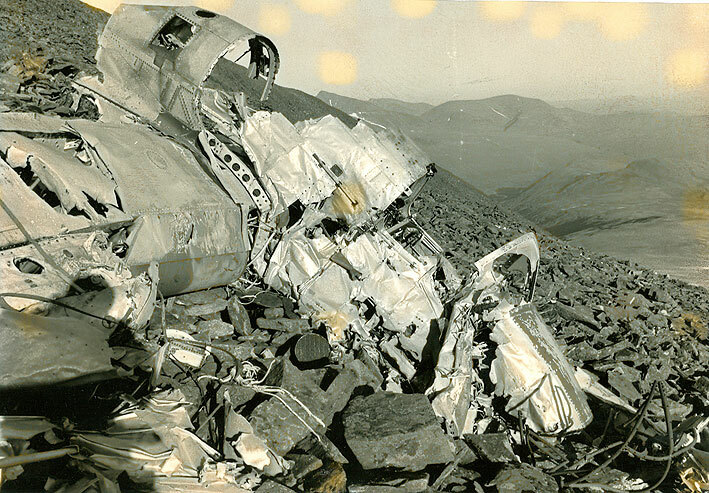 That the wreck in the mountains was a British twin-engined bomber of the type Handley Page Hampden was soon determined by the parts that remained. On the inside of a hatch they found the letters AE436 painted. 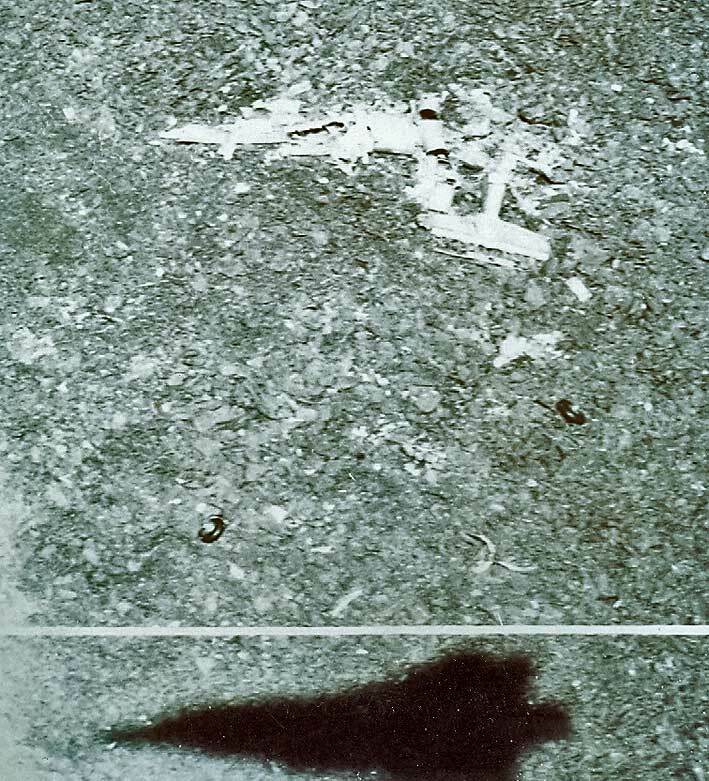 Through manufactureplates on the engine (only one engine was found in 1976) and other evidence it was soon confirmed that the aircraft was AE436 with the code PL-J. Further, items of equipment was found with the text RCAF (Royal Canadian Air Force) which placed the bomber in 144th Squadron. Other finds of equipment with crewnames on them proved that the plane was infact the same that Sowerby and Evans left behind 34 years earlier. Two of the three bodies found were identified by their ID badges (William Bowler and John Campbell). The identity of the third deceased was established through a process of elimination (James Jewett). But what was the truth behind the incident which Evans and Sowerby presented to the Swedish interrogators? The background was that the Germans had placed the battleship Tirpitz in the Norwegian fjords, where the battleship presented a major threat to Allied convoys for Murmansk. Several convoys had been attacked, in which the convoy PQ 16 suffered heavy losses due to submarines and torpedo flights from Norway. Despite warnings and advices against it Churchill sent another convoy, PQ 17. It was a total disaster, only 11 out of 33 ships reached the port of Murmansk. The British Admiralty now tried to suspend convoy traffic. But Churchill had visited Stalin in Moscow and promised to send another convoy in August with the name PQ 18. The British immediately began to prepare. It was decided that the 144th and 455th squadrons equiped with the torpedo aircraft Handley Page HP.52 Hampden TB.I would be transferred to northern Russia and relocate to Vaenga. Both the 144th and 455th squadrons belonged to Coastel Command and was based at Leuchars. An American cruiser, Tuscaloosa, sailed from Clyde to Murmansk with 300 tons of supplies and 157 groundpersonel. The cruiser was escorted by two destroyers with another 40 tons of supplies each.. The 2nd of September 1944, 144th and 455th squadrons were ordered to leave for Sumburgh in the Shetland Islands. In the evening, at 20:30, 4th september Pilot Officer David Evans and his crew started. Signal mechanic Corporal BJ Sowerby joined. 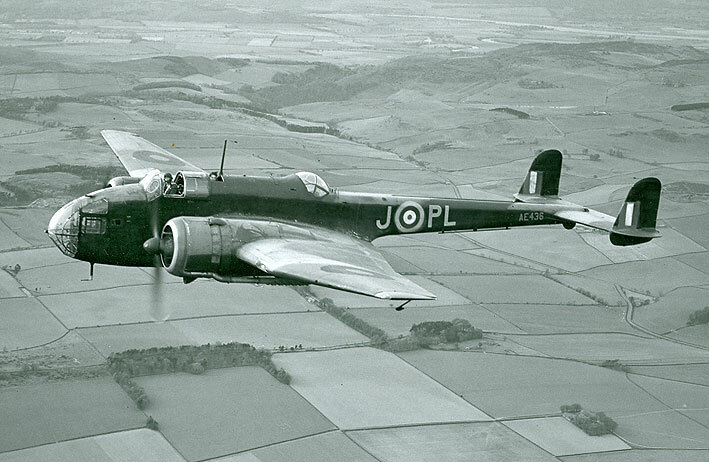 The aircraft they flew was a Handley Page HP.52 Hampden TB.I (Torpedo Bomber Mark I). The aircraft was built in August 1941 by English Electric in Preston and had manufacturing number EEP9277 and serialnumber AE436. The plane belonged Coastel Command 144Sq. With callsign PL-J. Altogether 16 Hampdens from 144 Sq left this evening for the base AFRIKANER in northern Russia, not far from the Finnish border. The flight was scheduled to go towards Norway, north of the mountain Okstindan at 6300 feet and into Sweden towards Överumans western tip and then across Finland towards AFRIKANER. Flight distance Sumburgh-AFRIKANER is approximately 1200 miles. Some machines flew the route in 6 hours and 40 minutes. An average speed of approximately 176 mph. AE436´s part was the stretch Sumburgh-Tsatsa, approximately 758 miles. If they kept the average speed, 176 mph, their flight time would approximately be 4 hours and 19 minutes. Because of a stormfront with low clouds AE436 came slightly off course and took a route further north, towards higher terrain. 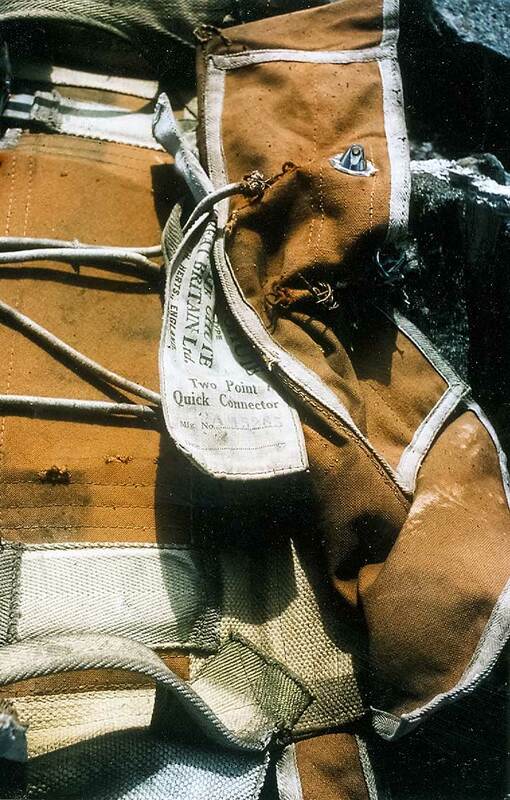 There the bomber was hit by icing due to the weatherconditions. 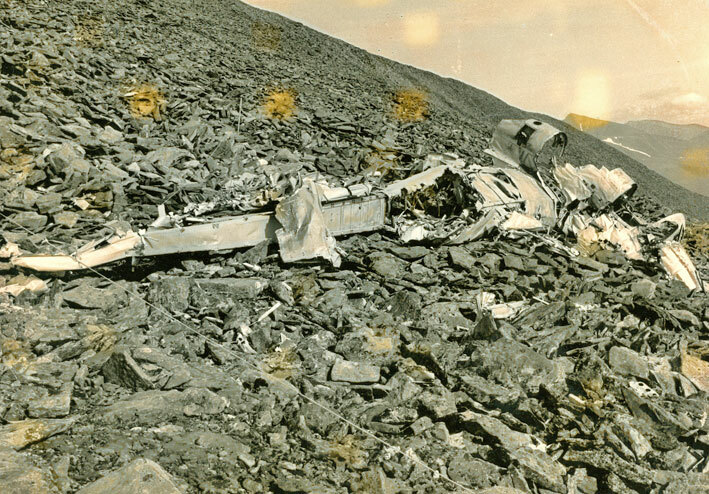 AE436 struck the mountainside of Tsatsa probably sometime between 01:20 and 02:30. The angle of impact was slightly uphill. Mountain terrain at these altitudes is mainly made of coarse boulders, so when the aircraft hit the ground it was torn to pieces. 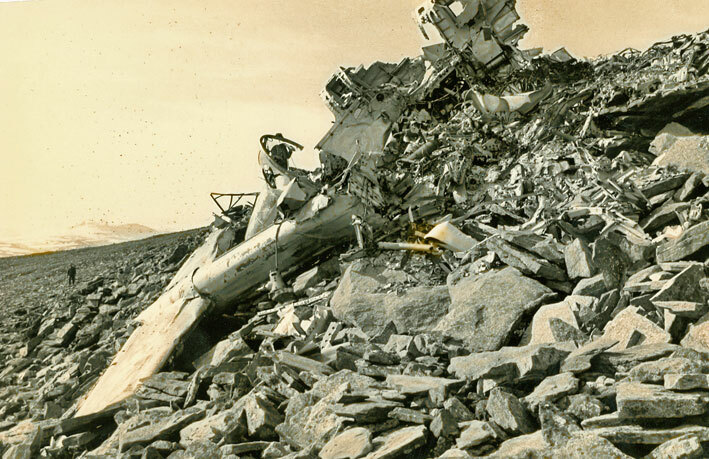 Sheetmetal, propellers and engines were ripped off and the plane tumbles about 1300 feet, with parts, equipment and crewmembers thrown among the rocks. The rear of the fuselage breaks off by the wing, fold parallel with the fuselage and the bomber becomes engulfed in flames. Navigator Bowler and tailgunner Campbell was thrown out of the plane and was probably killed instantly. Radioman Jewett remained in the aircraft when it caught fire and was killed. The pilot Evans escaped through the broken canopy. Evans reportedly had burns on his face. He may have recieved these if he tried to rescue Jewett. Sowerby said afterwards that he had been thrown out of the plane. 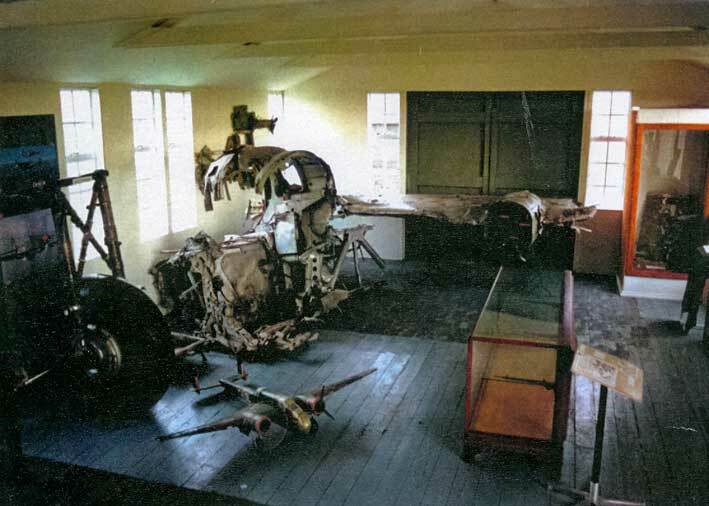 Sowerbys station was in the least damaged part of the aircraft. Presumably, he has been able to leave the aircraft through the undamaged roofhatch. After this Evans and Sowerby left on foot down to Kvikkjokk were they served up a whole different story, presumably to be sent home quickly and not interned. 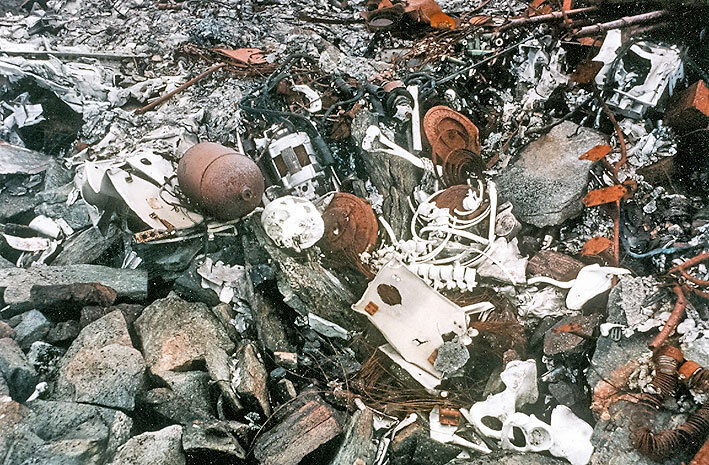 31/8 at 22:30 - started from the Shetland Islands and dropped a 1000 kg mine off the coast of Narvik. The wind had been south-westerly and very strong. During the flight towards the target the right engine did not work very well. Cloud heights fell gradually and ice started to build on the wings. Evans consultated the look-out and decided to drop the mine and return to base. When the decision was made Evans estimated that they was by the Norwegian coast, between Narvik and Trondheim. Due to distance from homebase no radio contact was possible. During the return flight, the aircraft come through the clouds at about 300 feet and hit a range of hills. The aircraft immediately caught fire. Upon impact, only Evans and Sowerby were secured at their stations. The accident took place 1/9 at 22:30. Evans and Sowerby remained in the vicinity of the wreck. A few hours later two germans and two norwegians showed up and captured them. 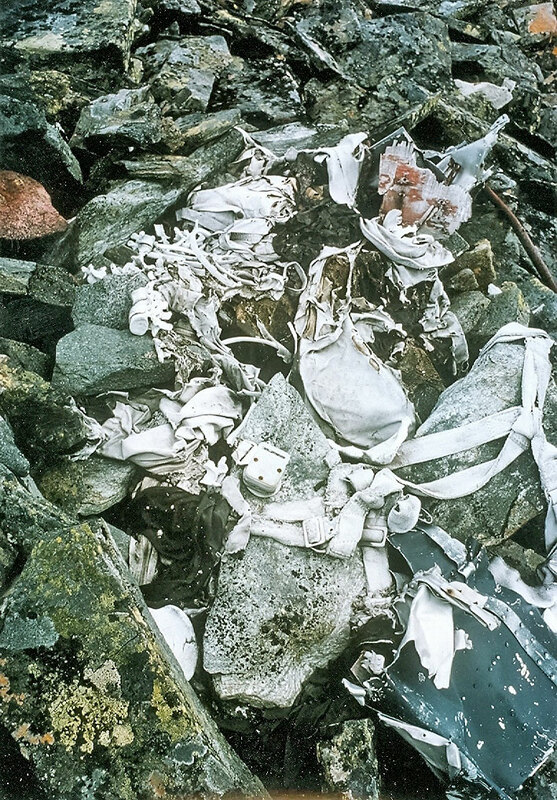 After a body search they were brought to a village. In the village Evans met an German who probably was an officer. The Germans behaved correctly. Evans and Sowerby was housed in a wooden building in a room with a small window. They had not been questioned. At about 24:00 Evans and Sowerby decided to flee. They had then been in captivity for about 20 hours. They knocked out the window and climbed out. No guards was seen. Evans explanation for the lack of guards was that the Germans considered him too badly wounded to try and escape. At the accident he had recieved a wound on the head. Blood from this and his faceburns had been a frightening sight. After a few hours walk in an easterly direction, they came to a few solitary Norwegian farms. There they received food and rested. Then they began the trek towards Sweden. After a comment by Captain Nyberg that it must have been a many aircrafts involved the minelaying operation. Evans replied: "twenty or thirty aircraft, perhaps a hundred". He did not know. On September 12 they arrived at Falun and Främby camp. Here they had to stay for a short while. But as early as September 21 they were sent back to England via courier flights from Bromma. 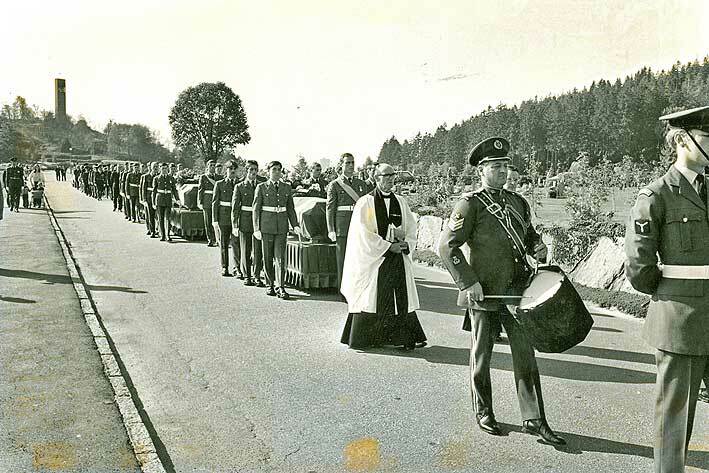 The remains of the three crewmen that was found in 1976 was taken to Göteborg where they were buried with honors on september 24, 1976 at Kviberg Cemetery. The wreckage was salvaged by the british and transported to England and the Lincolnshire Aviation Heritage Centre in East Kirkby. 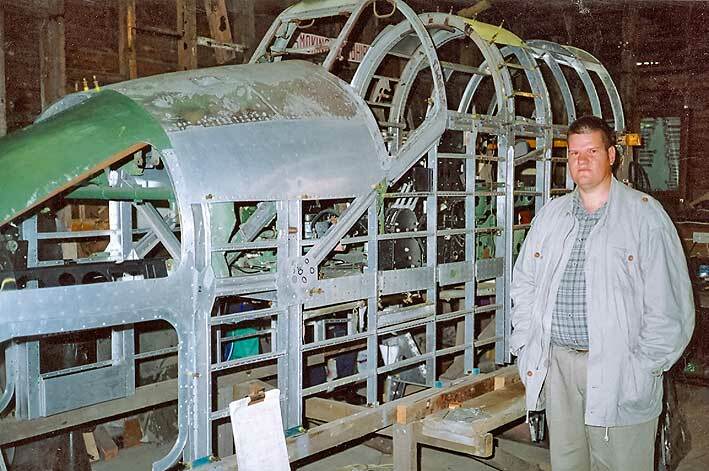 The parts will be included in a restoration project of another Hampden. The pilot Evans had said during interrogation that they had overheating problems with one of the engines. During examination in England of the cockpit's left side it was discovered that the mechanisms regulating the cooling flaps to the engine had failed. A small nut had wedged itself in the control chain and locked the entire mechanism. Can this little nut have been a contributing factor to the accident? 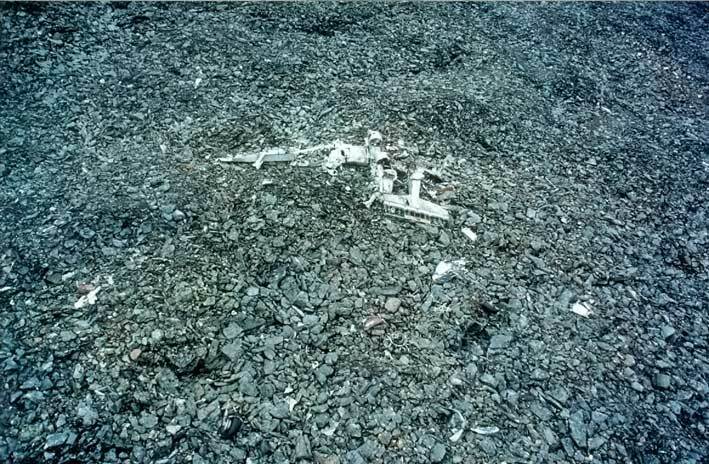 AE436's second engine was found 21/7 1987. About 1000 yards from the main crashsite and 1300 feet lower. It was found by Tjelvar Öster from Sundsvall when hiking on Tsatsa. The engine was also salvaged and shipped to England. All three are buried in Kviberg Cemetery in Gothenburg. 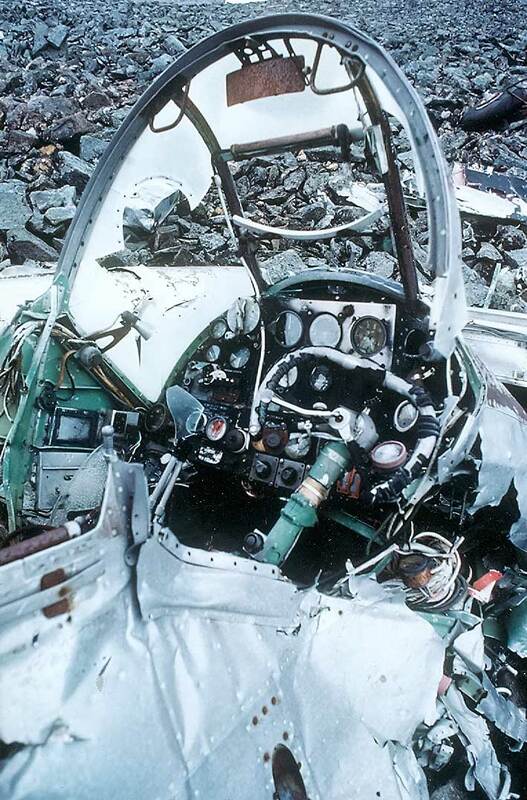 Together with the prematurely deceased Magnus Löwenstein several enthusiasts like Greg Stenström, Bengt Bergström, Kent Klingstedt and others in Västernorrland Historical Society made a solid job with the two Hampden crashes. By visits to the crashsites, contact persons, map events and collect facts from all corners of the world, both in Sweden and abroad. An exemplary effort.